- How to keep chickens from pecking each other? - How to make compost out of chicken manure? - Why chicken make great gardeners? 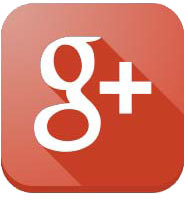 - Why you need ventilation in your coop? 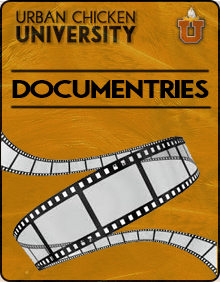 - What you will need to get started? - How much room do chickens really need? 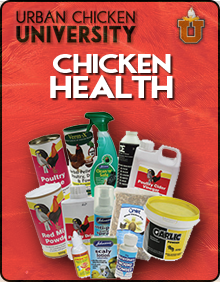 - How to keep your chickens healthy? 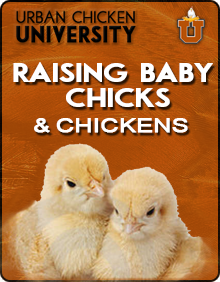 This program will introduce you to the basics of urban chicken raising. The last thing you want to do is to build or buy a chicken coop, purchase a few starter hens, buy some food, get the entire family excited about the adventure that lies ahead, only to have a bureaucrat pay you a visit and let you know (kindly or otherwise), that what you are doing against a city ordinance and that not only will you have to get rid of your new chicks. However many, many residential areas will allow people to raise a few chickens on your property. The best thing that you can do to make sure is to contact your city offices and simply ask them if there are any ordinances on raising chickens in your backyard, and what they are. People like to keep backyard chickens for lots of reasons but eggs are probably at the top of the list. There’s nothing like eggs laid by your own happy healthy pet. They’re fresher and tastier than store-bought eggs and can be more nutritious too! Each hen will lay about one egg per day but this can vary depending on the breed and individual bird. Chickens prefer a dark private nest box that is the size of about 12” wide, 12” long and 12” tall like this one. When a hen is done laying their egg, they like to announce it! 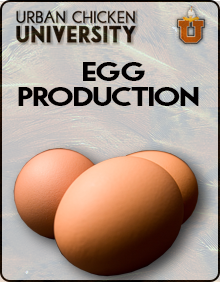 Egg production slows down as chicken’s age and during the winter time. One way to increase egg production in the winter is by having a light in their coop. They will need a break of a constant light on in their coop. A timed light is recommended, giving them about 13 hours of light that comes on at 5:00 am goes off at 6:00 pm. Roosters are not needed to get eggs in fact the eggs you see in the store were not fertilized by roosters which is good because roosters can be loud and aggressive and they're not allowed in the city. The color of the shell does not affect the taste and they're all delicious. You’ll find that they all come in different shapes and sizes too. Some will be so big you can't close the egg carton top of them others will be funny shaped. With a small back yard flock you’ll get to know which hen lays which kind of egg so you'll always be able to tell which of your birds has been laying. There is one drawback to fresh eggs. These eggs are so fresh that they can be difficult to peel when hard-boiled. Because the eggs membrane inside the inner shell still very strong. After the hard boiling process place the hot eggs immediately into ice cold water you’ll find that they peel quite nicely. Some like to be held, some tolerated it others don't like it at all. Most probably fall into the tolerate category. As I said before raising chickens is easy. One of the main reasons is because at dusk they instinctually head straight for the coop and put themselves away. Chicken only need food and water and to be let out in the morning and closed up in the evening. 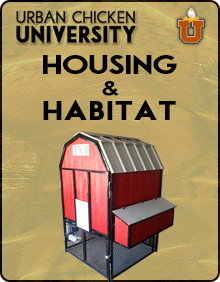 With an automatic feeder and waterer with large reservoirs and an automatic door opener leaves you to only collect the eggs and clean the coop occasionally. Fairly maintenance free. When the temperature is expected to drop below freezing you’ll want to turn on a heat lamp for the night. Chickens actually handle cold weather much better than hot so this is mainly to keep their drinking water from freezing. Having access to clean and unfrozen water is very important. Chicken’s drink more than you might think. 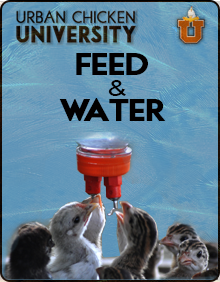 You might want to consider a non-freezing chicken waterer for those cold winter months. Stagnant water becomes slimy after a bit. So once a week you’ll need to scrub the container and refill it with fresh water. On cold, cold nights you might want to use a 250 watt red light, because it provides heat without the brightness so they can sleep. You can also lour them into the coop before dusk. If you need to put them away sooner, this can be done by bribing them with cut pieces of cabbage, corn, crackers, leftover pasta, rice or other kitchen scraps. All you have to do is come in behind them and close the doors at night to keep the draft and the predators that way. Be sure to secure exterior doors with the bolt latch for safety, like this. Because even in the city, raccoons and possums can be a serious threat. Unfortunately I know too many people who lose their pet chickens to predators even though they thought their coop was secure, so please make an extra efforts to ensure your girls are safe. Next we'll talk about what you’ll feed your backyard flock. 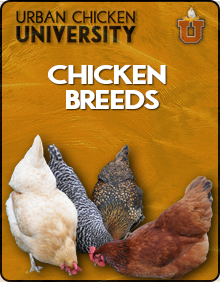 Chickens need commercial feed made especially for laying hens to ensure proper nutrition. Treats and scraps alone are not adequate. There are many brands and types to choose from you can get from the local farm and ranch store. Organic feed for example or if you want extra omega 3 in your eggs. You can buy feed with flaxseed and there typically sold in forty or fifty pound bags. Chicken feed should be stored in a dry place that rodents can access. A metal can is best because rats can’t chew through like they can a plastic container. Some people like to make their own feed with assorted grains and seeds. But you may prefer to take advantage of all the research that's gone into the production of commercial poultry feed. Hens tend to kick up straw and dirt so both feed and water should be up off the floor. High enough to keep clean but low enough so even the smallest chicken can still reach it. Cracked corn or scratch grains can be given in small portions as an extra special treat. But this is fattening and has little nutritional value so it should not be relied upon as a primary food source. It’s also best to avoid giving them meat, sugar or anything greasy or spicy. If you want your girls to be healthy and provide you with nutritional eggs, then make sure they get a variety of vegetables, fruits, grains, and bugs for extra protein. Table scraps are fine but never give them anything moldy. You’ll find that hens eat more in the winter time when they're burning extra energy to stay warm. When bugs, grass, and garden scraps are not as readily available like water, they should also have access to food at all times. It’s necessary to provide oyster shell and grit as well. They won’t be able to digest many foods without grit. Free ranging chickens do find some of their own grit but it’s still good to put some out just in case. These can be found in large or small bags. But for a handful of backyard hens a small bag will do just fine. Oyster shells is a source of calcium to ensure that their eggs have a nice hard shell and grit is made up a tiny rocks used in their gizzard to grind up food since chickens lack teeth. Some chickens need more than others so it's best to keep the supplement separate from the regular feed so individual birds can nibble as needed. 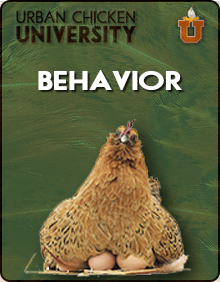 Now let's talk a little about chicken behavior. You might be surprised to learn the chickens make great pets and just like dogs each one has an individual personality. They'll even come when you call them especially if you have treats. I think watching chickens run is hilarious and you probably will too. Whenever possible I’ll let my hen’s free range within my backyard. The more I let them wonder around the happier and healthier they seem and egg production increases too. I simply propped open the door so they can still access to food, water, and nest box throughout the day. The more space they have the better it will insure they all get along. Chickens only peck and harass one another when they're stressed, crowded, or bored. I never had a problem with that because there's adequate room and resources in my yard to support 5 hens. Even on rainy days to chickens enjoy being outside if it rains hard they’ll seek shelter under a tree and when lightens up they’ll venture out once again. If you're worried that your dog will hurt you chickens and some breeds will. They can be trained not too; some dogs are not a problem at all and show no interest in the chickens whatsoever. I have a mountain cur squirrel hunting dog that is obsessed with the chickens and will launch at the chicken run fencing that is protecting them. This can be a hassle how ever there is hope your dog can be trained by following this instructional video available at this website. If you don’t have time or patience to train your dog you can purchase one of our dog kennels at www.k9kennelstore.com. This is what I did; they take turns sharing the yard at different times of the day. Now we can all enjoy the yard in peace. When left to roam chickens will explore every corner of the yard and stayed busy foraging for seeds and bug, they keep the grass mowed too. They’ll even eat all those nasty snails and slugs in the winter time you can let them forage in the your garden where they can feast on grubs an provide fertilizer. In the summertime you will need to keep them out of your garden because they will eat all of your vegetables and berries. Some people clip their flight feather's to prevent their chickens from going over the backyard fence. I found this not to be necessary if your yard is not barren and has lots of interesting plants in places to explore your girls will be perfectly content to stay put. Chickens are not good flyers but smaller breeds are lightweight, younger birds could probably breach a fence but they're not likely even try unless they're being chased. They'll spend the day keeping themselves busy scratching at the ground looking for things to eat. One of their most favorite activities is dust bathing. During the wet season dry fluffy dirt is harder to find so they'll go to extreme measures to find a place to do this. So it's important to provide them with a dry area year round. Dust bathing is essential for keeping them free of parasites like mites or lice and they really seemed to enjoy it. Don't worry they'll shake up all the dirt when they're done just like a wet dog. If you are looking to spend so time with your chickens a nice pass time is to grab a shovel and start digging. They will come running because they know this means worms and bugs will be easy to get as they turn over the garden to mix in the straw and fertilizer they’ll be right there ready to compete with the biggest worms. It's really fun and relaxing to watch chickens engage in all these activities. In fact some would even say it's therapeutic. It's time to talk about chicken waste. One of the biggest concerns people face when trying to raise backyard chickens is odor. Chicken don’t stink but of course their waste can. Just like waste from any animal has the potential to smell. But five birds generate less waste and one medium size dog and unlike dog feces. Chicken manure makes wonderful fertilizer for the garden. Since chickens sleep all night on a preach most of their waste inside the coop will be concentrated directly underneath. This makes it easy to collect every couple of days by placing a catch basin under them. Inside the run their waste will be scattered about here most people use what's called the deep layer method. Which simply means you can occasionally toss fresh straw over what’s already there. Only once in the spring and once in the fall do I need to break it all up and thoroughly cleaned the coop and run. Unfortunately free ranging birds will leave waste where they go. I either hose it off the deck, or scoop it off the lawn on a regular basis. During the winter months goes directly into the garden beds. Were quickly breaks down and doesn't stink. In the summertime when the gardens is occupied it goes into the composter to create what some people call “Black Gold” Which is excellent for your garden. Overall I found chicken waste to be less work smelly and easier to deal with then, dog waste. You've probably noticed by now that most of my hens are very different looking. There are hundreds of beautiful breeds to choose from. My favorite one is this Plymouth Rock we call Rocky it is a dark gray with white stripes. She's definitely the friendliest and has the most personality. 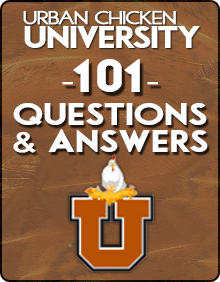 If you would like to learn more about a certain topic, please visit our chicken university on this website. We have listed questions people ask most about raising back yard chickens.